In a mortar combine lemongrass, garlic, spring onion and a bit of salt, pound into a fine paste (or put it in a food processor). Transfer paste into a large bowl, add shrimp paste, fish sauce, soy sauce, sugar, and sesame seeds and mix well. Soak 10 bamboo skewers in cold water for about 30 mins to prevent them from burning. With wet hands, (helps prevent meat mixture from sticking to your hands) divide the beef mixture into small balls, and then roll them into a sausage shape. Thread 2 beef sausage shape onto the skewers. These can be kept in the fridge till required, or frozen. Brush the beef skewers with oil and cook on a grill pan or barbecue for about 6 minutes, turn regularly till charred, and brown. 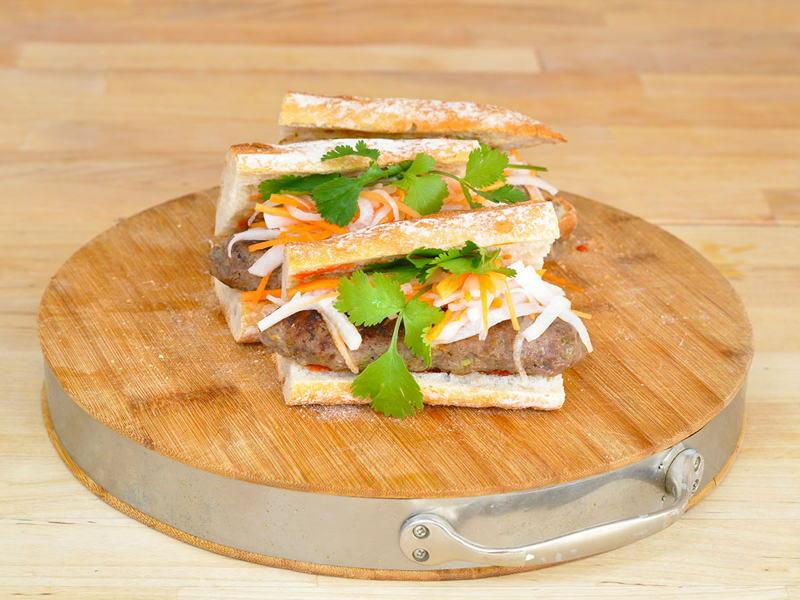 Serve in a Banh Mi baguette or on their own with a vermicelli salad. Dissolve the sugar and rice vinegar in a bowl with a pinch of salt. Add the shredded carrots, daikon and star anise, making sure they are all covered. Marinate for at least 15 -30 minutes then leave to drain in a sieve for 5 minutes or keep in a sterilised jar for up to 5 days in the fridge.